Jennifer was an SIU-Carbondale, Saluki where she earned her degree in interior design. After graduation she worked on her AutoCAD skills at a metal manufacturer. 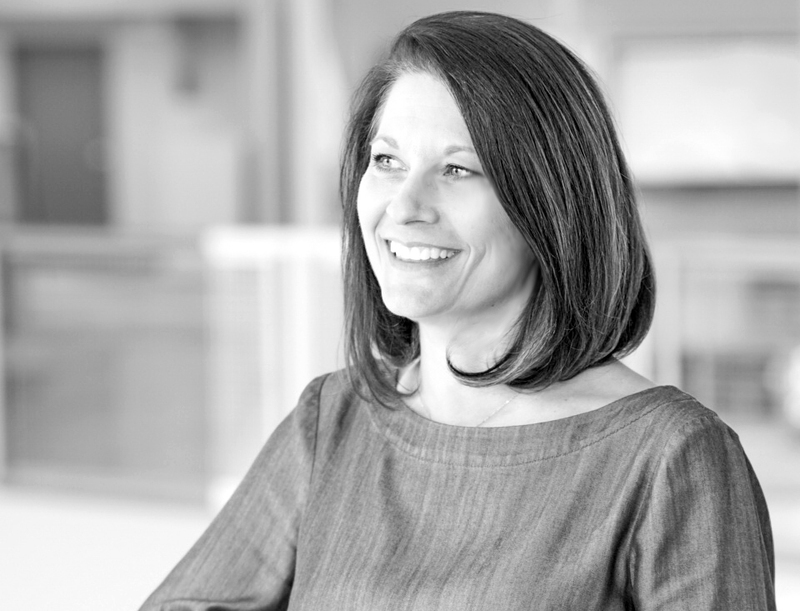 Her first job in St. Louis was with Arcturis where she became one of the first on-site Facilities Planners for Edward Jones. From there she had various roles and leadership opportunities at Knoll Textiles and Herman Miller. Jennifer came to Color Art about 13 years ago to join the Workplace Strategies Team. AM So what does Workplace Strategies team do? JG We guide clients through discussions or workshops to uncover their business objectives and growing pains. We draw on research around workplace insights to help alleviate this pain through workplace solutions. We provide thought starters that show how we can meet their functional and aesthetic goals as well as a realistic budget. We find that being on the same page early in the process improves the lines of communication and satisfaction throughout the project. JG My favorite thing right now is that we invested in our space. Having a space that reflects and supports your company’s values and culture is key to engagement in the workplace. Second I would say I love this job! We are focused and forward thinking about trends in the workplace. Moving a company or redesigning a facility is usually not the full-time job for the clients we meet with daily. Our job is to make the process simple to get from point A to B while helping them attain their business goals. We have a process that is very expedient and successful. AM What would your hobby be if money weren’t an issue? JG Begin construction on our lake house. Immediately. I would become the full-time general contractor. (laughs) The lake house is key to drawing our grown kids home after college. (laughs) We plan to have Christmases and Thanksgivings with our kids and their future families. JG I think everyone should have a job that allows them to be their authentic self. They should be around people who are OK with who they are, every day, all day long. I have that and I believe everyone deserves that. They should find a place that ultimately allows them to be who they are. AM Any go-to television shows? AM What’s your favorite way to start the day? Superhero Ok. This is going to sound silly but I’ve often called my husband Dudley Do-Right because he always comes to save the day. That character has become very endearing to me. Movie Princess Bride and a Knight’s Tale. Those two movies are always on TV at any given moment. Holiday Summer vacation!! (laughs) It is a lot less work than other holidays. Dessert Angel food cake with my mom’s divinity icing. It is like heaven; pure pink sugar almost as good as cotton candy in icing form. Pineapple on your pizza? NO! St. Louis Destination I love the original Old Spaghetti Factory on the Landing. As kids my parents would drive us an hour to downtown for special occasions. As an adult it is where my husband proposed. We still go there because it holds a lot of memories for us.